2H semiconducting phase few-layer MoTe2 (3-6 layers) has been grown on 1cm2 size c-cut sapphire substrates using low-pressure chemical vapor deposition technique (LPCVD). Grown sheets can also be transferred onto other substrates such as quartz, SiO2/Si, PET, metals, and others on request. Few-layer MoTe2 reach full area coverage on sapphire, exhibit outstanding environmental stability, surface smoothness, and uniformity. Grown sheets are environmentally stable and exhibit band gap between bulk (0.6 eV) and monolayer (1.1 eV). Special note: Despite extensive R&D efforts, CVD grown monolayer MoTe2 are environmentally rather unstable due to uncontrollable defect characteristics. We are unable to provide monolayer thick MoTe2 at this time. 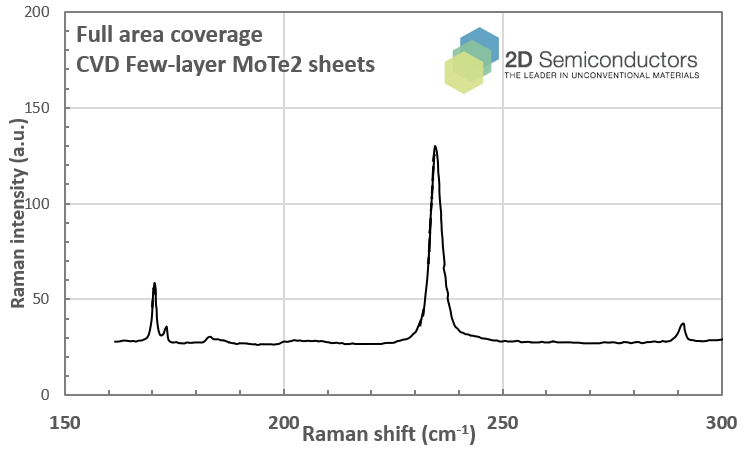 Characteristics of CVD grown 2H (semiconducting phase) MoTe2 sheets by 2Dsemiconductors Inc.